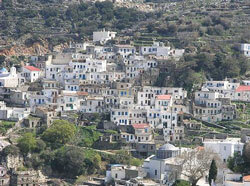 The left hand route comes to the village of Komiaki (43 km from Hora) built at a height of 700m. Within a small distance from the village (10 minutes on foot) has been found a rare, for the island’s data, Mycenaean domed tomb, which you may visit (there is an inscription on the main road). The surrounding area of Komiaki (Koronida) has an abundant supply of water, rich vegetation and orchards with fruit trees and vegetables. This is a very green area, and along the road from Komiaki to Apollonas there are walnut trees, oak trees, laurels and orchards. 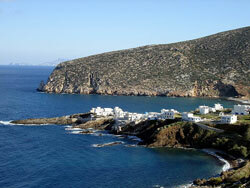 Apollonas (54 km from Hora) is a beautiful fishermen’s village on the north-eastern coast of Naxos, with a large sand and pebble beach, in an area where ancient marble quarries have been found. Near the village, at the entrance to an ancient quarry, there is an unfinished statue (a kouros) lying on the ground (10.45 m. in length). It stands in the spot where it was being carved, from where it has never been moved. 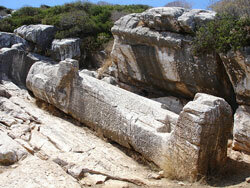 It dates to the beginning of the 6th century BC and is probably a sculpture of the god Dionysus.